You'll have access to a large library of pre-made blocks, they're each grouped in different categories. You can place an unlimited number of blocks in your creation after which it's possible to export and use in the game engine for your choice. Using the batch exporting features you can export layers of your model, or automatically create a 4 or 8-direction rotation! What game engines support Asset Forge creations? Any game engine that can load OBJ models, FBX models or PNG sprites. This includes (but not limited to) Unity 2D + 3D, Unreal 2D + 3D, ThreeJS 2D + 3D, Construct 2D, Stencyl 2D and Game Maker 2D. What blocks are included in the most recent version? You'll find a list of all collections and blocks here. Free updates include both new features and additional blocks for the standard and deluxe editions. Will I be able to create custom blocks? Certainly! Check out our guide to find out how to create custom blocks and collection. It's as easy as placing your own models in a folder! Can I upgrade to the deluxe version if I own standard? Yes, visit this page and you'll receive a 50% discount on deluxe which is more or less the price difference between standard and deluxe. What's the license for models made using Asset Forge? You may use the models in any type of project, including personal, education and commercial. There's no need to give credit to Asset Forge. Will my kids or students be able to use it? The interface is designed to be easily understandable and will include tooltips, shortcut keys and hints. This should make the program accessible to anyone from kids to professionals. Browse all blocks included in the latest version of Asset Forge. We're currently working hard on version 2.0 of Asset Forge! It'll be completely remade from scratch improving on every single aspect of the original. More features will be added to the list as they're developed! Will this update be free? Absolutely! Everyone will be able to upgrade to Asset Forge 2.0 without charge. Does this update also include new blocks and collections? For sure, we're working on some great new collections including one with easier building blocks and one to create blasters! Giving an exact date is extremely hard. We're a really small development team taking on a huge project and we'd like to take our team to create a proper, and complete project. We're aiming to release the update later this year. Join the community to share custom creations, report bugs and request features! 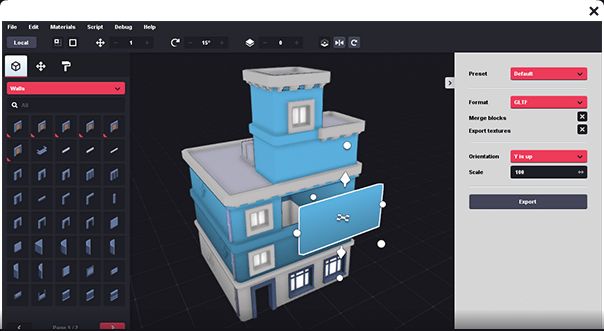 Asset Forge is available as two versions, both offer the same features (and free updates) however the deluxe version includes additional blocks.